SD Bullion is an extension of the silver community website silverdoctors.com. Open for business in Marc of 2012, they boast of "Nothing Fancy. Just a telephone and Low Prices." Customer service after the sale not so good this time. Incorrect order and lack of service once there is an error. I ordered 25 Canadian silver maple leafs. They come from the mint in yellow top 25 count. What was delivered was 25 silver eagles. A green 20 count and five loose coins. I called and told what I got. The young lady had to check what to do and would call me back later that day or next morning. Three days past. Since I had heard nothing I figured they did not want to exchange or do anything. I would just move on, keep the Silver Eagles not bother to call back so trashed all the original packing material and figured I was done with SD Bullion forever. Three days later I received a call. First was told she tried to call me but no answer. In these days of cell phones on our hips, good quality caller ID and voice mail I dislike being lied to. Three days in customer service is an eternity. Her best resolution was that I was to send her a check for the wrong silver eagles they sent me and then they would send me the correct order. Her goal was the additional sale. I did not want to send more money to the company that just got my order wrong and to the young lady that so easily lied to me just moments earlier. I had paid by check for the check discount. I offered to do this if I paid by credit card and they waved the credit card fee. At least I would have the protection of the credit card on the second order. My second choice was that I could pack this stuff up and send back to them and hope they would get it right the next time. Ok send me a pre-paid package and I will put it in. We don’t do that. OK I deal with some computer companies, walk into FedEx or UPS store with a number they pack and ship company has an account with them and I pay nothing. We don’t do that. SD Bullion does not pay shipping on returns. At this point she was going to place me on hold to talk to someone else, I told her I was on my way to an appointment and did not have time. I stayed on hold for about 3 to 5 minutes until I got to my appointment. Never heard any more from them. The reality is the mistake was minor financially. 1 ounce silver eagle to a 1 ounce Canadian silver maple leaf. The difference was less than $1 per coin less than $25 in my favor. When she was placing me on hold I told her that I wasn’t interested in the time it was going to take to package and have two shipping cost. And they should leave it as is. The only downside is I really wanted Silver Maples, my grandson liked the looks. Now I will buy them someplace else and they will cost me more since the spot price is up. All because someone at SD with the initials MT did not take enough interest to fill the order correctly. They lose a customer and if in fact they do have the lowest prices I loose on pricing in the future. They do not seem like a bad company just limited in customer service this time when I had the problem. I have placed multiple orders with SDB, and had been very satisfied. My most recent purchase left me feeling gouged and I will not return out of principle. I purchased silver Krugerrands at their 'special' price of 20% off premium and free shipping ($58.18/each). The $58.18 is the highest price I ever saw them sell for (not a 20% discount); and they now sell at $37.49 on eBay by SBD. This is not a reflection of change in spot, as that is essentially the same. They just gouged the people that bought early. In all transparency, other dealers were similar, but not as great a price drop. I overpaid by 50%, due to their '20% off special', but will not fall for that again. Poor service, very sluggish, there are other bullions who works faster than them. Wont buy next time. 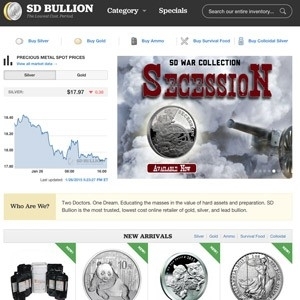 SD Bullion is a great place to purchase your metals. Great service and great prices. I have purchased from them 3 times so far. I am a new precious metals investor and so far so good. Will purchase again. I bought 4-10oz silver bars. I payed by check and the turn around was super fast with my delivery. I was very happy. Will buy again. Although prices were good, the fact they charge for shipping cancels the benefit. I will go with other that provide free shipping with a minimum order. Shipping was slooow. I ordered from another dealer the same day, and received my package one week sooner. Finally, because SD only used a flimsy padded envelope, the 10oz silver bar I received had significant damage. If you're going to make me pay for shipping I should get my order sooner and not damaged! I place regular orders with all the big online bullion dealers. SD is one of my top go-to sellers. Good prices and service. Issues are handled promptly. Trusted. the web page and copy of the receipt had different descriptions about how to submit payment by mail. But, my package arrived in the time expected anyway. I am glad your mail room staff can make things happen the right way on the first try. The service has been excellent. When you talk to someone they are knowledgable and helpful. I always got my product when they said I would and the followup communication is clear and timely. Excellent service, and your website is very easy to navigate. I received my order quickly and it was exactly as shown. Wonderful company and your prices seem fair. I will have no problem recommending you to friends. My son told me about you and he did extensive research before he purchased. Excellent price, quality, and quick shipment. I know other family members who have found this company to be reputable. I would order through SD Bullion again. I really appreciate the way you sent my package... covert, and well packaged as to not bounce around in the box. Thank you for caring and doing the extras to insure package is not disturbed. The service was excellent and look forward to purchasing more in the near future. I am already recommending you to all my friends interested in gold and silver. Thank you again for being trustworthy and reasonably priced. The CC verification process on THEIR end was not operable. When asked what the problem was, they told me to keep submitting (with the same result). I tried to cancel order, but they said I was "obligated" to purchase. What? I said if that is the case then honor the current ask price of silver. They said no. I went back to flawless ordering at JMBullion, even though the premium over spot is slightly higher. Worth it when there are no headaches and no snarky customer service reps. Very pleased with Your services and promptnes,definitely will recommend you to my friends.It's a pleasure to do business with You,thank You! THE COINS I RECEIVED WERE IN GREAT CONDITION AND I GOT WHAT I EXPECTED. THE ORDER CAME IN FAST. YOUR PRICES ARE EXCELLANT ALSO. I LOOK FORWARD TO THE NEXT TIME I PLAN TO BUY SOME MORE COINS. You find out how good they are when they take care of a problem. A1 customer service. I AM A HAPPY CUSTOMER! SD bullion had a special on random year Silver Eagles BU condition last week. Not sure if BU means the same thing everywhere. I've gotten coins from the gas station change drawer that were in more "BU" condition. When I buy BU I expect the same thing with any dealer, a "wow" factor when I open my box. Coins were tarnished from fingers, had blotchy marks on them,and quite frankly, nothing about them was brilliant. They did not even pack them tight enough so that they would not clink against each other in transit. I would not buy from them again, nor will I be calling in refund to pay for my ugly coins to be restocked. Very unfortunate, but I would rather keep shopping elsewhere. My transaction with SD Bullion was great I called them up and ordered what I wanted, they sent a notification of the transaction and Boom two days later I received my order. I just really like doing business with you guys. Your website is easy to use, I like the fact that it updates the shopping cart every 3 minutes. Prices and shipping is very fair. I will continue doing business with you as long as the service stays the way it is. I might not be a big buyer but they treat me just the same with service and best prices on special or their everyday stock.I have been able to get silver right from the mints. Thanks Doc. Good service,excellent prices. Price is very important. I have used 2 other companies but discovered that their price is better. My loyalty is as good as your prices. However, I couldn't find better prices so SD has my business. Great service, quick, friendly and very convenient. Thanks Doc! Fast shipping but the order was wrong and needed to be resent after I had to send their wrong order back. They sent me all the proper shipping info but was unable to print the shipping label they sent. This is my first time investing and I am very satisfied with the overall navigation of the site. Very impressive and easy to understand for a small-time investor such as myself. Received my first order quick and well packed, quality bullion, and just placed my second. I've been buying from them regularly for over a year. Always great products and reliable service. I like how their package doesn't say 'silver coins' to deter mail theft. Having bought a couple times from SDB I can recommend them with one qualification. I wish they did electronic check (saving me a stamp) like JM Bullion but the few extra days delay is worth the saving. Their prices are unbeatable. My local coin shop is astounded at the prices I have been getting bullion for from the Doc. Keep stackin'! I often find the best price on hard to find silver rounds at SD Bullion. Orders are well packaged and arrive quickly. I don't buy fancy, limited edition coins, and I don't mess with coins for numismatic value. I'M STRICTLY A STACKER. SD Bullion has never failed! Thanks for the $7.77 shipping deal! Very easy experience- check pricing at other sites and this group beat the others I checked. I read a lot of bad reviews on all kinds of bullion companies but I took a chance on SD Bullion. Beautiful piece, received 4 days earlier than expected. Very happy with this company. I really enjoy searching the themes and products of SDBullion. I have ordered twice now. No complaints. Big fan of SBSS series. Keep it up. I'm always open to buying Chris's products. Good prices all around, especially on the SDBullion proclaim liberty 1 oz. bars. Love it. I bought from here because it was the lowest price from a trusted company. I was rather annoyed by the fact that they couldn't buy a box to ship it in. You have to take on from USPS? It was also eBay brand, and I don't feel like I can sell something in eBay packaging for as much as if it were a real gold company. Hopefully I am wrong on that though. Price was good, but the overall experience can be improved. Best prices, service meets expectations. SD Bullion consistently has the best prices, and their service is as described. Zero complaints. Title says it all. Even with shipping you can't find a better price. Easy site to navigate, best value of ANY silver/gold site, Appreciate the speed of service and deliveries GREAT JOB !